Jacre Limousin Stud cows on Klipfontein near Bedford in the Eastern Cape. The Limousin breed originated in the rugged Marche and Limousin regions of France, known for extreme summers and winters. The Jacre Limousin Stud’s connection to France dates back to 1987 when 11 heifers were imported from that country. “They came in by Boeing,’’ says Pierre van Niekerk (67). Three of the 11 heifers were then incorporated into the fledgling Jacre Limousin Stud, where they all made significant genetic contributions. Over the past three decades, the Jacre herd has been built up to a total of 140 females, using artificial insemination (AI) and embryo transfer programmes, in which French genetics were utilised in conjunction with selected local genetics. From left: Vanessa (Pierre’s daughter), Pierre and Jacques (Pierre’s son) on Klipfontein. 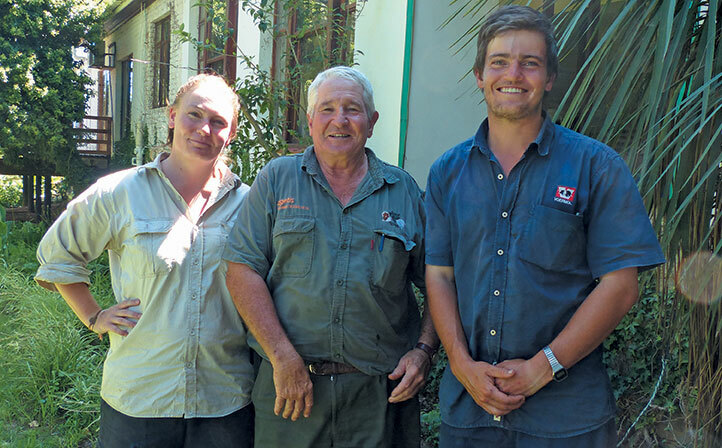 Pierre initially farmed Bonsmara-Shorthorn crosses along with Merino sheep and Angora goats on the 3 000ha Klipfontein farm between Bedford and Cookhouse in the Eastern Cape. To add value to his beef herd, he introduced Limousin bulls in the mid-1980s. Pierre says he was amazed by the increase in the weaning weights of the Limousin crosses, fuelled by the high frequency of the myostatin gene mutation, F94L, found in Limousins, which ensures an increase in muscle fibre with no risk of double muscling. “If you want to breed weaners that are going to the feedlot, you must be crazy not to use a Limousin bull,’’ he says. When Pierre decided to establish a Limousin stud in 1986/1987, he was surprised by the scarcity and high cost of Limousin genetics in South Africa. Therefore, despite being able to source a handful of exceptional old cows from Brian Hart (Queenstown) and Theo Kruger (Bloemfontein), Pierre was relieved to discover that he could import good heifers for a similar price to those available in South Africa. Soon he had agents selecting heifers on his behalf in France, of which three, namely Violet, Ursula and Amke, were eventually introduced to the stud with great success. “All three left an indelible mark on the stud,’’ Pierre says. Through the years, French bulls, including Tarvis, Genial, Dauphin, Thetis, and currently Accent MN and Uskudar, have also made a valuable contribution to the Jacre stud. Pierre’s dedication to French genetics, instead of larger US-type animals, stems from a belief that the smaller-framed, French animals are better suited to the predominantly sweetveld of Klipfontein. “I also like the French cattle’s muscular broadness from the back all the way down,” he says. In addition, all French Limousin bulls undergo strict progeny testing at the Lanaud national bull testing station near Limoges in France [with only 12 of the 700 young bulls tested per year becoming AI sires]. Pierre is therefore always assured of sourcing the best possible genetics from the traditional home of the Limousin breed. The Jacre Limousin Stud is farmed extensively and receives a production lick in winter and a phosphate lick in summer. Besides a few hectares of Kikuyu pasture near the Klipfontein homestead, female animals receive no extra feed except during dry periods. However, although 30ha of irrigated lucerne along the Fish River is predominantly used to grow out bulls, this feed is used to prepare about 50% of female animals for AI. Pierre’s extensive approach to beef production has ensured that heifers are mated at 24 months. He explains that he simply does not have enough feed to prepare heifers for mating at a younger age. Cows that are not artificially inseminated are mated either to self-bred bulls or locally purchased bulls. A 15% heifer replacement rate is adhered to, with cows on average remaining productive for 11 years on the veld (Violet, one of the imported French heifers mentioned earlier, was looked after with great care and reached the age of 21 years). Calving takes place in September and October, with the herd having an average ICP of 400 days and an average calving rate of 90%. All cattle are dipped about six times a year to combat ticks. Adaptability to veld conditions, temperament, mothering qualities and a short, smooth coat are all important selection criteria for Pierre. Although good milk production is critical to the functioning of any beef herd, he says it is important to ensure a balance between efficient milk production and overall fertility in the herd. Jacre bulls are inoculated for heartwater, gallsickness and redwater and are marketed every year at the Kroonstad Central Bull Breeders’ Group Sale, while a number are sold directly from the farm (bulls will also be marketed at the National Limousin Sale this year). In 2015, a total of 36 bulls were sold, while 29 were successfully marketed last year. In 2016, the average price for a Jacre bull was R22 000, while a top price of R30 000 was achieved. With the opening of a bull station in Alexandria, linked to the multidisciplinary Beef Genomics Programme (BGP), Jacre bulls will again undergo performance testing (Phase C), which was discontinued when the Queenstown bull station was closed in the late 1990s. According to Pierre, one of the Jacre Stud’s greatest achievements was having bulls in the top four positions in the 15- to 18-month age category at the 1997 National Limousin Show in Bloemfontein. Although he has rarely shown Jacre stud animals recently, mainly due to transport costs, he still shows animals at the nearby Bathurst Agricultural Show. Here, Jacre Stud animals have won numerous awards over the years, including the Supreme Champion Interbreed Bull in 1990. More recent achievements include a bull, Jacre Killer VG 9915 (the senior and breed champion at the Bloemfontein Show in 2002), being selected to represent the Limousin breed in the BGP, which includes a total of 15 breeds. Jacre Killer VG 9915 and Jacre Incredible VG 9734 also proved to be influential self-bred sires. The Limousin, with its high meat-to-bone ratio, is all about the production of superior carcasses, says Pierre. According to him, the slaughter-out rates of Limousin crosses are, on average, 4% to 5% higher than those of other established beef breeds. A competition that stands out for Pierre is the Bathurst Agricultural Show of 2002, when four Limousin/Shorthorn/Beefmaster-type oxen (with live weights between 406kg and 478kg and carcass weights between 284kg and 318kg) slaughtered out at 66,5%, 70,7%, 68,6% and 69,9% respectively. Unsurprisingly, Pierre has become well known at carcass competitions, including the national competition.In 1997/1998, Pierre won both the SA champion reserve single and SA champion reserve group beef carcass titles. This was followed by winning the SA single beef carcass title on two occasions (1999/2000 and 2004/2005). Today, Pierre’s 40 Limousin-type commercial females are put to a Shorthorn bull in the hopes of producing future award-winning carcasses. “Now that my son Jacques (24) is back, we’re going to get involved in block tests and shows again,” he says. Phone Pierre van Niekerk on 087 802 0470, or 079 881 5800.